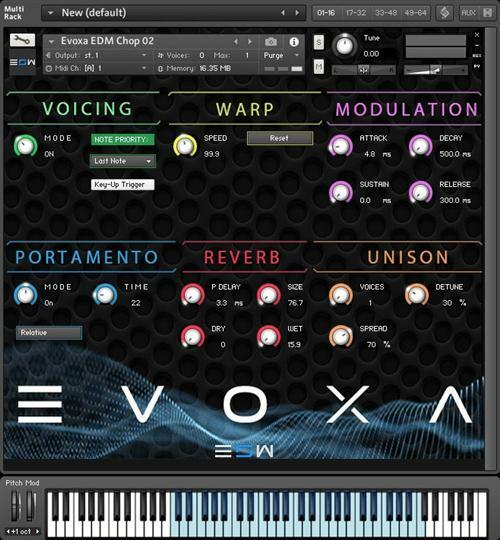 Echo Sound Works Evoxa KONTAKT | Free eBooks Download - EBOOKEE! Posted on 2016-08-02, by manhneovn. Echo Sound Works, the creators of the best selling KONTAKT library Sub Zero 808, is excited to bring you a brand new KONTAKT instrument called EVOXA. It's a multi-genre vocal chops engine for producers and DJ's. EVOXA comes loaded with almost 1 gigabyte of samples making up 200 KONTAKT presets. We designed EVOXA for music producers looking for easily playable, fine tuned, inspiring vocal chops perfect for multiple genres of music including Future Bass, Trap, Deep House, Hip Hop, RnB, Chillout, Future House, Melbourne Bounce, Tropical House and so much more. The KONTAKT instruments come with an easy to use custom interface that gives you all the control you need to seamlessly integrate any of the vocal chops into your productions. VOICING MODES These will determine playback mode like Monophonic, Legato and Polyphonic. WARP The Warp mode allows you to speed up or slow down the sample length. Perfect for getting the chops or individual notes to fit with your BPM. MODULATION This includes controls like Attack, Decay, Sustain and Release. PORTAMENTO This module gives you control over glide time and glide mode. Advanced options like note priority is available. REVERB We've included a reverb section to add depth to the vocal chops. UNISON ENGINE This will allow you to create wide unison leads out of any of the patches. No comments for "Echo Sound Works Evoxa KONTAKT".